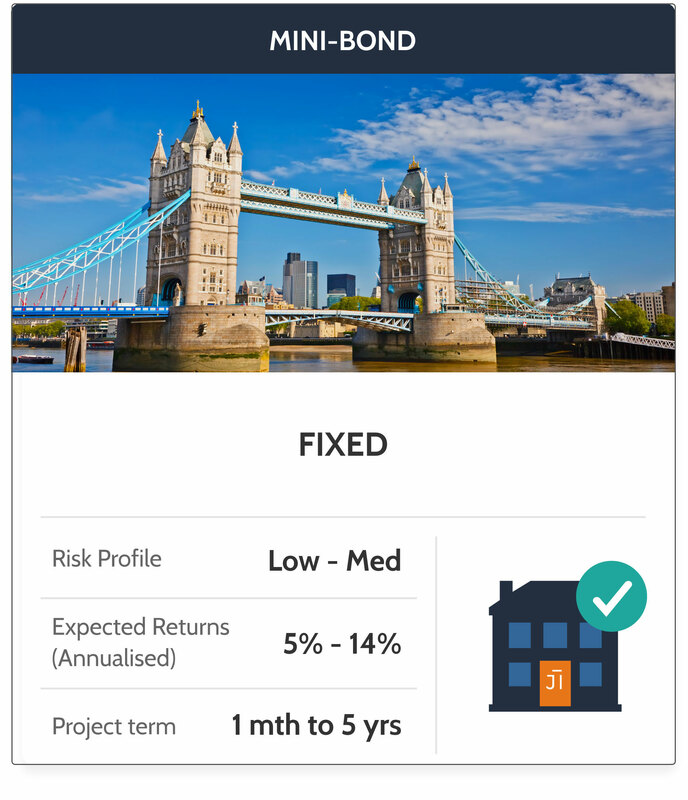 Through a mini-bond investment, you can effectively invest in a portfolio of property projects without taking on the risk of any individual project and with the benefit of a fixed return and timeframe. Mini-bond investments are ideal for those that are interested in investing in property but might not have the market knowledge, experience or the time to analyse individual property projects across the various sectors and locations. Shojin Property Partners uses the funds raised through the mini-bonds to invest in a range of projects, including commercial and residential rental property, secured lending, and development equity. The returns generated from those investments are expected to be higher than the fixed return offered to investors. Investors are offered a fixed return, so any income generated above the fixed return goes to Shojin Property Partners, while in the event that there is a shortfall this is covered by Shojin Property Partners. Investors are given the choice to invest in a variety of mini-bond investments depending on their personal preferences and circumstances. Firstly, investors can select how often they want to receive their interest payments. Some investors prefer regular monthly income, whilst others prefer to receive their interest on an annual basis. For them we have monthly or annual income bonds. For those willing to forego regular interest payments in favour of a larger payment at the end of a longer period we offer capital growth bonds called “bullet” bonds. Secondly, investment timelines can also be chosen to suit your requirements. These range from bonds with 30-days notice all the way up to 5 years. Some investors might want timely access to their funds, whilst others are happy to secure the going interest rate for a longer period. All mini-bond investments are ISA eligible, making the returns on them potentially tax-free. Investors can use their annual ISA allowances or transfer-in any existing ISAs using the automated process on Shojin’s platform. By investing through a standard mini-bond, the risk profile is reduced when compared to investing on a project-by-project basis. The funds from these bonds are used to invest in a broad spectrum of property investments backed by the same due-diligence process carried out on all Shojin projects. Moreover, investors are never exposed to individual projects because both the interest and capital are backed by Shojin Property Partners. Therefore, in the event of a shortfall, Shojin would be liable to make up any balance. For those investors that prefer to take on even less risk, they can opt for a “Secured” mini-bond. “Secured” mini-bond investments are separated from all other investments made by Shojin, and the funds are only used to make first charged secured loans for use in senior lending. Since there is first charge security, in the event of a default on the loan, the underlying property can be sold and funds recovered. This therefore presents a lower risk than other type of investments.